I have been working on teacher gifts for "Meet the Teacher Day". 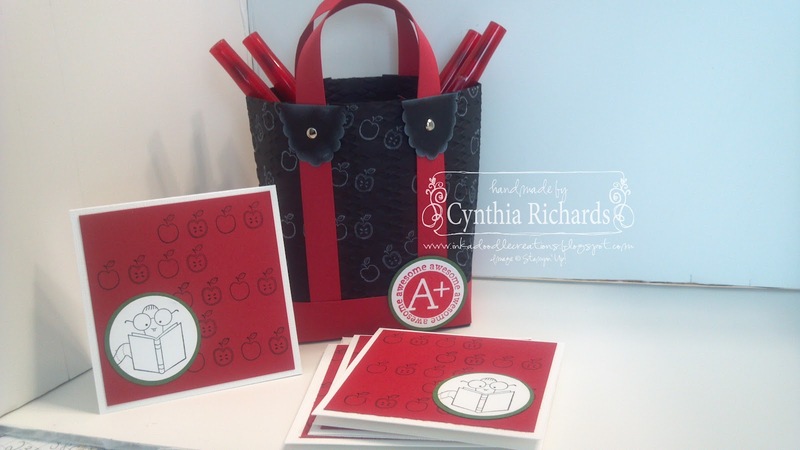 Each year, I make a little something special and fill it with teacher items. This tote, I made two of, one for each of my sons main teacher. I filled them with red ink pens, decorated sticky note pad, mints and 4 3x3" thank you note cards and envelopes. I have the pattern for the tote. Email me directly if you would like to have it. It is super easy to make. I love your tote's. I think all three of them are so cute. I would love to have the pattern for this one. Thanks for sharing your wonderful talent.